Agriturismo Il Grappolo is a large wine farm with half of its 45 hectares dedicated to vineyards it produces 120,000 bottles of excellent wine a year. Guests can sample the wine in the farm's 'enoteca' or enjoy a bottle over lunch or dinner in its pretty restaurant which offers an imaginative selection of meat and fish dishes. The apartments are all located in a tranquil position 800 metres from the restaurant, 'enoteca' and farm office. They are situated around a pretty courtyard surrounded by a garden with swimming pool. In the fully enclosed grounds there is a small enclosed lake, parking area and a spacious grassy area where children can play. The pretty view is across flat countryside to a row of green hills where you can see the medieval village of Suvereto just 1,5km away. The village has all facilities, including bank, small supermarket, tourist office, and several restaurants. There are nine apartments for rent (6 with one bedroom and 3 with two/three bedrooms). 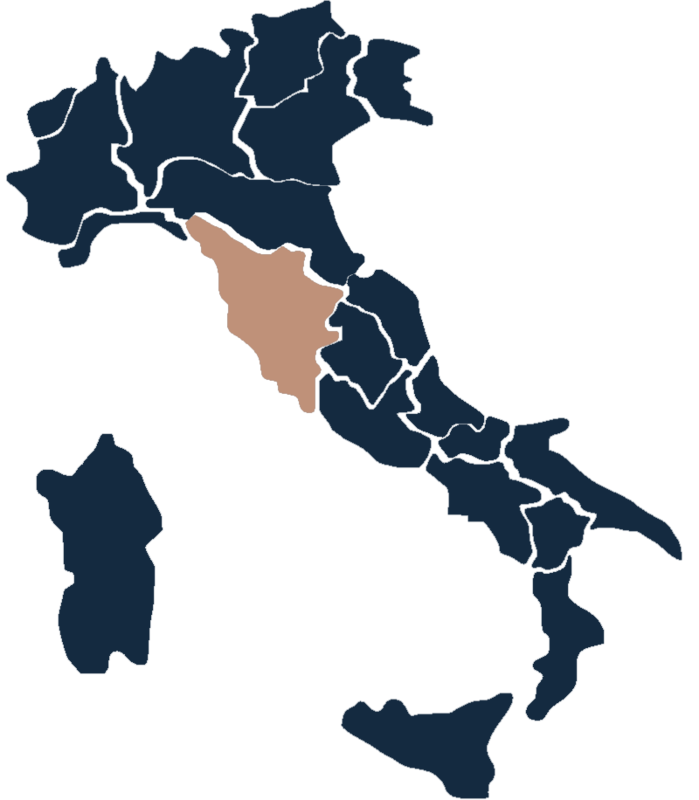 The apartments all take their names from districts of the village of Suvereto. They have been recently restored and furnished to a high standard with a concentrated use of natural materials. There are white glazed terracotta floors in the living rooms and parquet flooring in the bedrooms. Travertine marble has been used to tile the kitchens and bathrooms and for sinks, shower trays and wash hand basins. The furniture is of wood and leather. The spacious gallery mansards have parquet floors and low sloping ceilings. Each apartment has its own area for sitting outside furnished with table and chairs and there is plenty of space for relaxing around the lovely oval swimming pool (approx.10m x 20m) which has been specially designed to resemble a natural rock pool with small waterfall and children's pool. In each apartment you will find a book (in English and Italian) giving all sorts of useful information including places to visit and local festivals. Nearby there are horse riding stables and at Suvereto you can hire bikes. The nearest town, Venturina, is at 8km and has a large supermarket, tennis courts, railway station and thermal springs. There is lots to enjoy in the local area. Within a radius of about 20km you will find various medieval hilltop villages, the charming Gulf of Baratti with its beach, little fishing port and Etruscan Archaeological park, the Castle of Populonia with its amazing view of the sea, several nature parks including Rimigliano with its miles of sandy beaches edged with pine tree woods, the San Silvestro 'Archeominerario' Park, the seaside towns of San Vincenzo with its smart shops and Fallonica with its large Friday morning market and water fun park for children. Whilst a day trip will easily take you to the fascinating towns of Pisa, Livorno, Siena, Lucca and Florence. Ground Floor apartment with private entrance. Living room with french windows opening on to private covered patio, kitchen area with hob (4 gas rings), microwave oven, fridge/freezer, dining area with table and chairs, sitting area with satellite television and settee (which converts to a double bed). Bedroom with four poster double bed Shower room with shower cubicle, basin, bidet and w.c. (the shower room of Il Torrione is suitable for a handicapped person and has only a shower curtain). Central heating, Air conditioning, Fly screens, Telephone and Internet connection on request. Patio with table and chairs. First Floor apartment with entrance by communal outside staircase leading to large covered balcony. Living room with high, sloping, wood beamed ceiling and french windows opening on to the apartment's own area on the balcony, kitchen area with hob (4 gas rings), microwave oven, fridge/freezer, dining area with table and chairs, sitting area with satellite television and settee (which converts to a double bed) Bedroom with double bed (which converts to two singles on request). Shower room with shower cubicle, basin, bidet and w.c. Central heating, Air conditioning, Fly screens, balcony with table and chairs. Ground Floor: Private entrance Living room with french windows opening on to private covered patio, kitchen corner with hob (4 gas rings), microwave oven, fridge/freezer, dining table and chairs, sitting area with satellite television and settee (which converts to a double bed) Bedroom with double bed Shower room with shower cubicle, basin, bidet and w.c. First Floor: Gallery mansard overlooking living room with double bed (which coverts to two singles on request) and single bed Central heating Air conditioning Fly screens, patio with table and chairs. Ground floor apartment, private entry, patio and small private garden. Large sitting room with stonework kitchenette and white glazed terracotta floor, sofa- bed. A marble staircase leads up to the gallery (1.7m h) with parquet flooring and a double bed. Bathroom with marble shower tray. Large double bedroom with marble staircase leads up to the second gallery (1.7m h) with parquet flooring and double bed. Bathroom with shower (disabled access). Apartment has been equipped with microwave, espresso machine, safe, satellite TV and internet connection; air conditioning and heating. Can be divided up into studio room and double room. Ground Floor: Private entrance. Large open plan living room incorporating glass loggia overlooking garden and furnished with dining table and chairs, kitchen with hob (4 gas rings), electric oven, microwave, fridge/freezer, dishwasher, sitting area with large 'L' shaped settee and satellite television. Bedroom with double bed, bedroom with double bed (which converts to two singles on request) Shower room with shower cubicle, basin, bidet and w.c.
Depsitum €100 som tilbakebetales ved avreise hvis ingenting er ødelat. Frokost fra 08:00 til 10:00 € 12 per person. Barn 3 til 12 år € 6, 0 til 3 år gratis. Fra mars til juni åpen bare i helgene og ved reservasjon. Middag Meny a`la carte - 15% reduksjon. Ekstra skift av sengetøy og håndklær € 10 per person. Barneseng € 8 per dag. Turistskatter €1,50 per dag per person for alle over 12 år. Ankomst Mellom og Lav sesong Fleksibel fra mandag til søndag. Søndager bare ved avtale. Minimumsleie 3 netter. Ankomst høy sesong Fleksibel fra mandag til søndag. Søndager bare ved avtale. Minimumsleie 7 netter. Laundry room Yes, shared with washing machine, dryer and ironing facilities. Play ground With space for playing soccer and table tennis. Restaurant Yes. 800m From March to June open on weekends or on reservation. From June to September open every day for dinner and for lunch reservation. Finale cleaning Included. At departure the kitchen must be left clean.